Sounds like we’ve heard it all before, because we have, back in August 2013, and that turned out to be less than convincing. Skepticism is likewise mounting over current White House claims that Damascus used a chemical weapon against civilians in the village of Khan Sheikhoun in Idlib province on April 4th. Shortly after the more recent incident, President Donald Trump, possibly deriving his information from television news reports, abruptly stated that the government of President Bashar al-Assad had ordered the attack. He also noted that the use of chemicals had “crossed many red lines” and hinted that Damascus would be held accountable. Twenty-four hours later retribution came in the form of the launch of 59 cruise missiles directed against the Syrian airbase at Sharyat. The number of casualties, if any, remains unclear and the base itself sustained only minor damage amidst allegations that many of the missiles had missed their target. The physical assault was followed by a verbal onslaught, with the Trump Administration blaming Russia for shielding al-Assad and demanding that Moscow end its alliance with Damascus if it wishes to reestablish good relations with Washington. For her pains, she has been vilified by members of her own party, who have called for her resignation. Other congressmen, including Senators Rand Paul and Tim Kaine, who have asked for a vote in congress to authorize going to war, have likewise been ignored or deliberately marginalized. All of which means that the United States has committed a war crime against a country with which it is not at war and has done so by ignoring Article 2 of the Constitution, which grants to Congress the sole power to declare war. It has also failed to establish a casus belli that Syria represents some kind of threat to the United States. What has become completely clear, as a result of the U.S. strike and its aftermath, is that any general reset with Russia has now become unimaginable, meaning among other things that a peace settlement for Syria is for now unattainable. It also has meant that the rebels against al-Assad’s regime will be empowered, possibly deliberately staging more chemical “incidents” and blaming the Damascus government to shift international opinion farther in their direction. ISIS, which was reeling prior to the attack and reprisal, has been given a reprieve by the same United States government that pledged to eradicate it. And Donald Trump has reneged on his two campaign pledges to avoid deeper involvement in Middle Eastern wars and mend fences with Moscow. 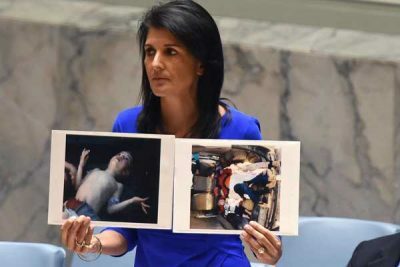 There have been two central documents relating to the alleged Syrian chemical weapon incidents in 2013 and 2017, both of which read like press releases. Both refer to a consensus within the U.S. intelligence community (IC) and express “confidence” and even “high confidence” regarding their conclusions but neither is actually a product of the office of the Director of National Intelligence, which would be appropriate if the IC had actually come to a consensus. Neither the Director of National Intelligence nor the Director of CIA were present in a photo showing the White House team deliberating over what to do about Syria. Both documents supporting the U.S. cruise missile attack were, in fact, uncharacteristically put out by the White House, suggesting that the arguments were stitched together in haste to support a political decision to use force that had already been made. The two documents provide plenty of circumstantial information but little in the way of actual evidence. The 2013 Obama version “Government Assessment of the Syrian Government’s Use of Chemical Weapons on August 21, 2013,” was criticized almost immediately when it was determined that there were alternative explanations for the source of the chemical agents that might have killed more than a thousand people in and around the town of Ghouta. The 2017 Trump version “The Assad Regime’s Use of Chemical Weapons on April 4, 2017,” is likewise under fire from numerous quarters. Generally reliable journalist Robert Parry is reporting that the intelligence behind the White House claims comes largely from satellite surveillance, though nothing has been released to back-up the conclusion that the Syrian government was behind the attack, an odd omission as everyone knows about satellite capabilities and they are not generally considered to be a classified source or method. Parry also cites the fact that there are alternative theories on what took place and why, some of which appear to originate with the intelligence and national security community, which was in part concerned over the rush to judgment by the White House. MIT Professor Theodore Postol, considered to be an expert on munitions, has also questioned the government’s account of what took place in Khan Sheikhoun through a detailed analysis of the available evidence. He believes that the chemical agent was fired from the ground, not from an airplane, suggesting that it was an attack initiated by the rebels made to appear as if it was caused by the Syrian bomb. In spite of the challenges, “Trust me,” says Donald Trump. The Russians and Syrians are demanding an international investigation of the alleged chemical weapons incident, but as time goes by the ability to discern what took place diminishes. All that is indisputably known at this point is that the Syrian Air Force attacked a target in Idlib and a cloud of toxic chemicals was somehow released. The al-Ansar terrorist group (affiliated with al-Qaeda) is in control of the area and benefits greatly from the prevailing narrative. If it was in fact the actual implementer of the attack, it is no doubt cleaning and reconfiguring the site to support the account that it is promoting and which is being uncritically accepted both by the mainstream media and by a number of governments. The United States will also do its best to disrupt any inquiry that challenges the assumptions that it has already come to. The Trump Administration is threatening to do more to remove Bashar al-Assad and every American should accept that the inhabitant of the White House, when he is actually in residence, will discover like many before him that war is good business. He will continue to ride the wave of jingoism that has turned out to be his salvation, reversing to an extent the negative publicity that has dogged the new administration.